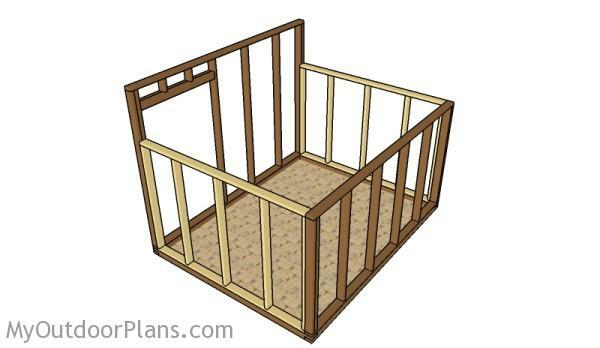 This step by step diy woodworking project is about 8×10 goat shelter plans free. 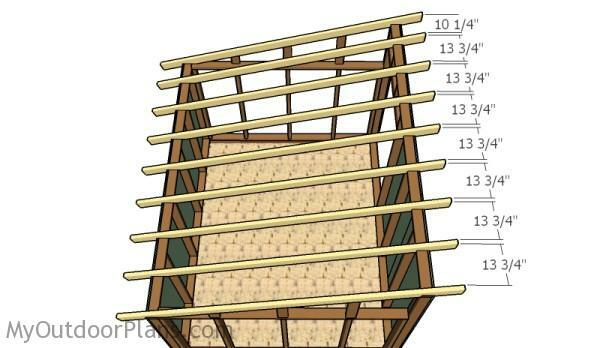 The project features instructions for building a basic goat shelter. This is a heavy duty construction that will stand time for many years in a row. The construction features a large access opening to the front of the shed. Make sure you take a look over the rest of plans to see alternatives and more projects for your garden. It’s that easy to build a goat shelter! The first step of the project is to assemble the base for the goat shed. Cut the components from 4×4 lumber. 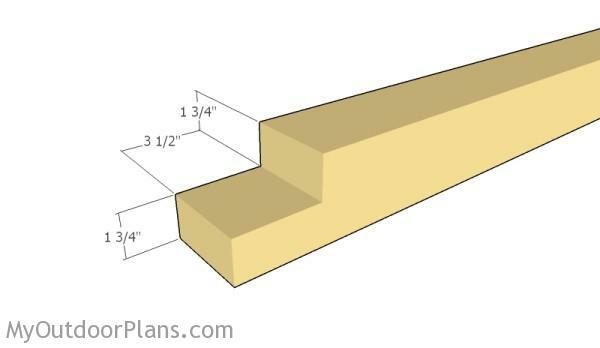 Use a circular saw to make the notches at both ends of the beams. Use a chisel to clean the recess, making sure the corners are square. Next, you need to assemble the walls for the goat shelter. Cut the components from 2×4 lumber. Drill pilot holes through the plates and insert 2 1/2″ screws into the studs. Use the information from the diagram to get the job done in a professional manner. Make sure the corners are square for a professional result. 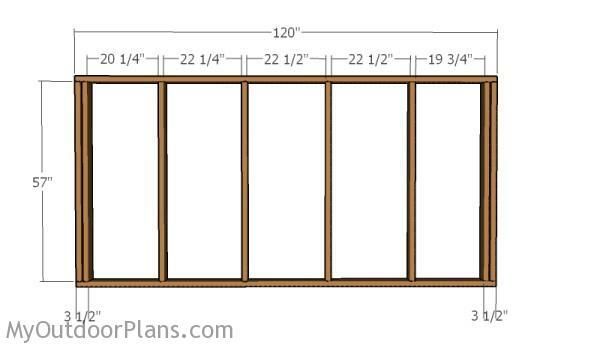 Build the front wall from 2×4 lumber. 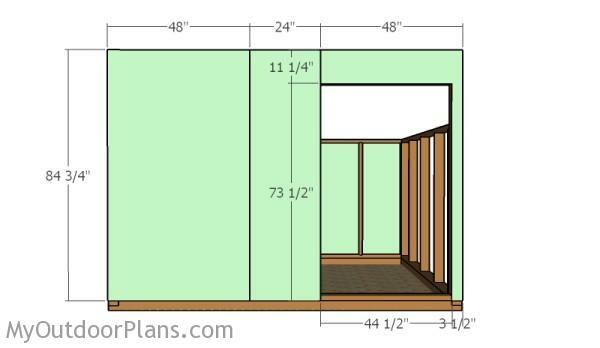 As you notice in the plans, you need to create a door opening for easy access. Build a double 2×4 header for adding strength to the structure. Make sure the edges are aligned, as well as if the corners are square. Fit the front and the back walls to the skids, as shown in the diagram. Drill pilot holes through the bottom plates and insert 3 1/2″ screws into the skids. Use temporary braces to secure the walls into place after plumbing them with a spirit level. 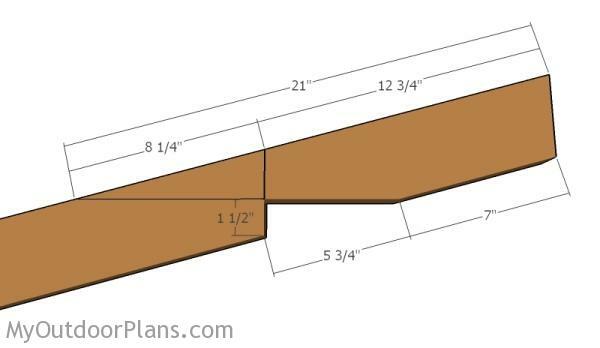 Build the side walls from 2×4 lumber. Drill pilot holes through the plates and insert 2 3 1/2″ screws into the studs. Take accurate measurements before inserting the screws, to get the job done in a professional manner. 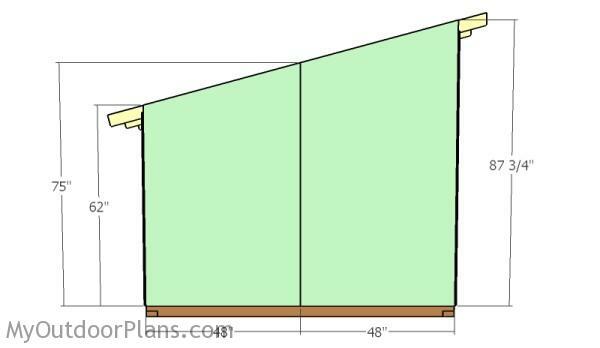 Fit the side walls to the goat shelter, as shown in the plans. Make sure the edges are aligned and check if the corners are square. Drill 3 1/2″ screws through the plates into the skids. In addition, insert 2 1/2″ screws into the adjacent walls to enhance the rigidity of the structure. Fit the 3/4″ plywood panels to the front of the goat shed. 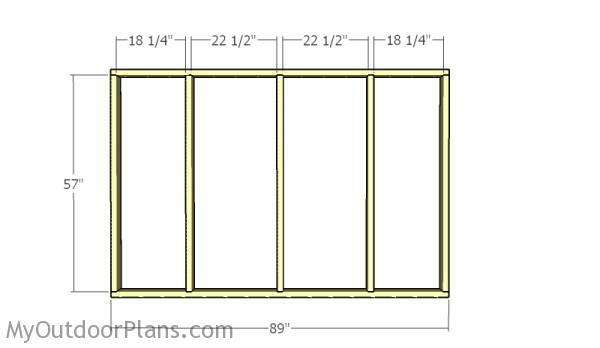 Align the edges with attention and secure the panels to the framing using 1 1/4″ screws or nails. Make the cuts to the panel around the door opening. 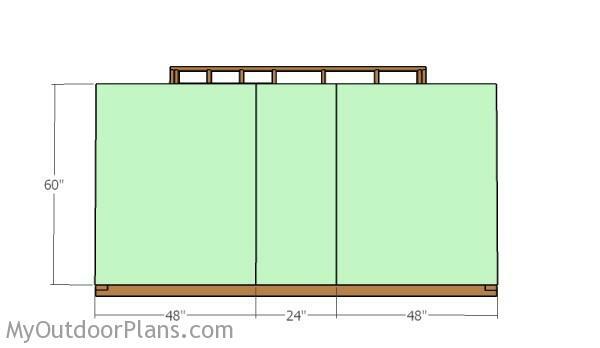 Fit the 3/4″ plywood panels to the back wall, as shown in the diagram. Leave no gaps between the panels for a professional result. 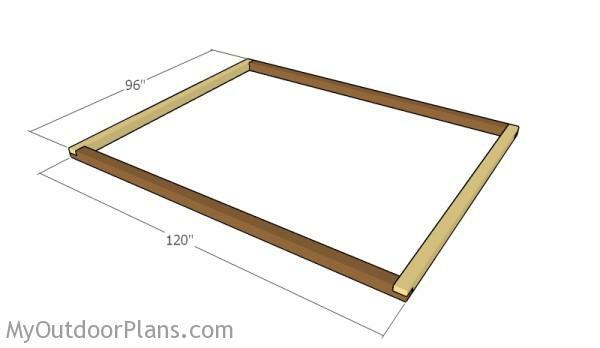 Use 1 1/4″ screws or nails to lock the panels to the frames, every 8″ along the framing. Build the rafters from 2×4 lumber. Cut one end of the rafters at 75 degrees. 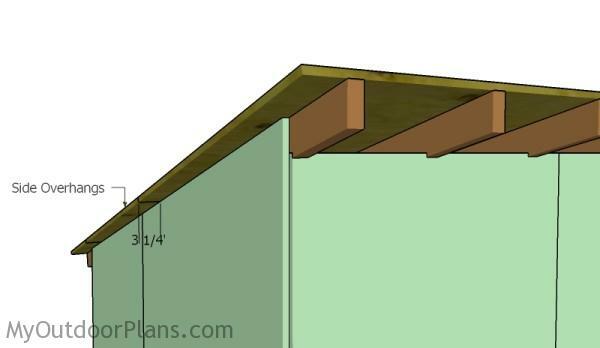 As you can easily notice in the plans, you need to make notches to the top of the rafters. Mark the cut lines and get the job done with a circular saw. 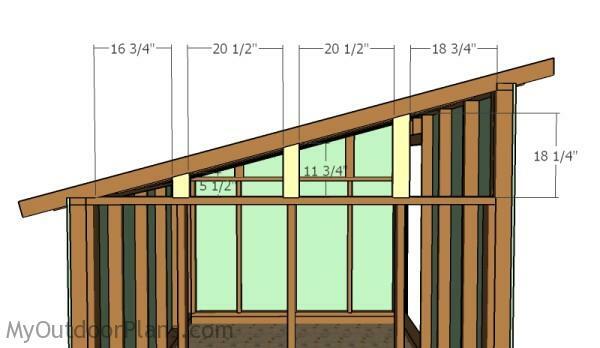 Also make notches to the bottom of the rafters using the information form the diagram. Place the rafters to the top of the structure. Use the information from the diagram to space the rafters properly. Drill pilot holes through the rafters and insert 3 1/2″ screws into the top plates. Fit the supports to the sides of the shed. Cut the top of the supports at 75 degrees. 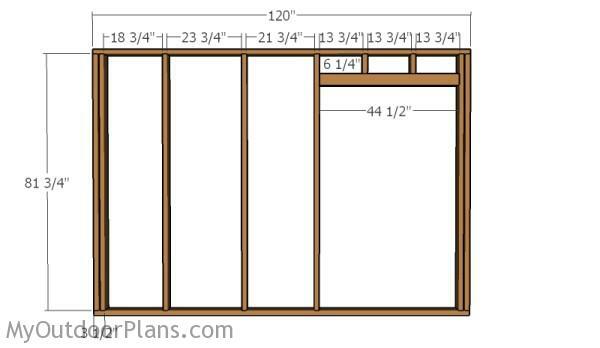 Fit the 3/4″ plywood panels to the sides of the goat shed. Cut the top of the panels at an angle to fit into place properly. Ones of the last steps of the outdoor project is to attach the roofing sheets to the rafters. Use 3/4″ tongue and groove plywood sheets. Leave no gaps between the sheets. Drill pilot holes and insert 2″ screws along the rafters, every 8″. Alternatively, you can fit corrugated metal sheets to the rafters, if you want to save money and time. When fitting the sheets, make sure you leave 3 1/2″ overhang on both sides of the shed. Cover the roof with tar paper, making sure the strips overlap at least 2″. Then install the asphalt shingles starting with the bottom of the roof. Read here more about how to install the asphalt shingles. Fill the holes and dents with wood putty and let it dry out for several hours. Use 120-200 grit sandpaper to smooth the surface. Remember that you can adjust the design and size of the goat shelter to suit your needs. 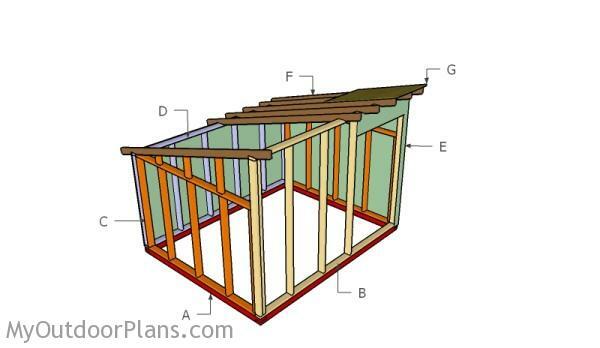 Check out the rest of the shed plans here and other animals plans here. 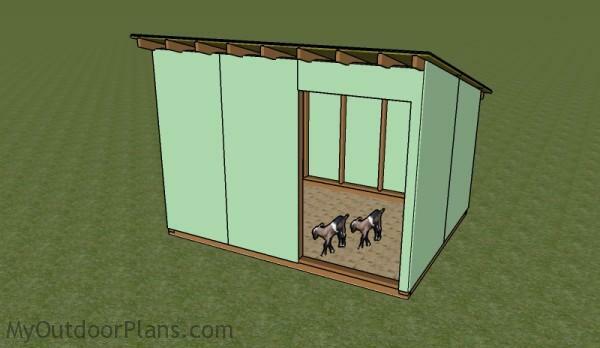 This woodworking project was about free 8×10 goat shelter plans. If you want to see more outdoor plans, we recommend you to check out the rest of our step by step projects. LIKE us on Facebook and Google + to be the first that gets out latest projects and to hep us keep adding free woodworking plans for you. Using the goat shed plans, how do you attach the 4×4 skids to each other? Half lap joints. You can see that in the second diagram. how do you keep the skids from rotting out when there sitting on the ground? You use pressure-treated lumber, which is more resistant. the opening won’t be to drafty for the goats? This is a summer field shelter. If you want to shelter the goats during the winter, you should consider building a door. Thank you so much for these plans. 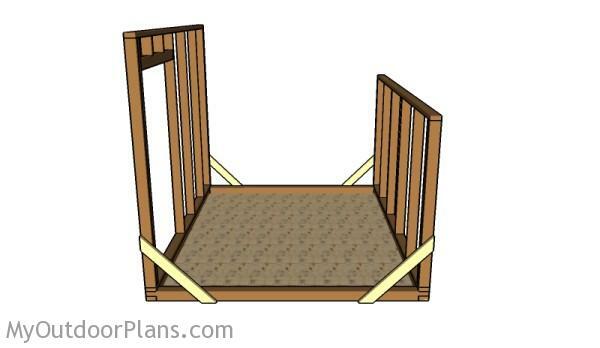 I have searched all over the web looking for the perfect plans to build my goats shelter. These have got to be the best plans I’ve found. And the easiest to follow. Again Thank you! You’re very welcome. Let me know how it comes out. I’d love to see a few pics of the shelter once you are done. Nice web site and lots of good ideas. Is there a way to download the SketchUp plan files – I want to modify a bit (make smaller for my site) and will be happy to send you back the revised file. No. I don’t share the original files. I tried printing out these plans so I could look them over at my leisure and actually use them if I decide to. For some reason I just got 13 blank pages. Please advise. Did you use the print widget on the left side of the screen? Hi. I would like to try to build this goat shelter for my goats. 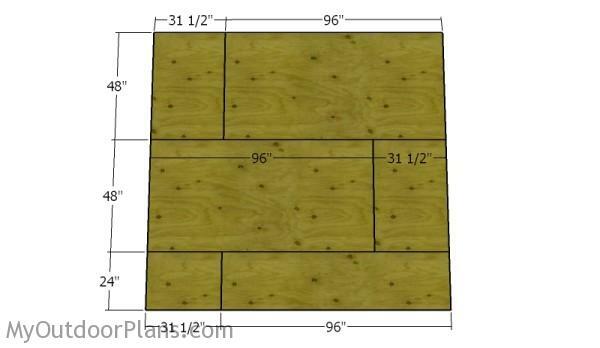 Do the plans come with a shopping list for the lumber and plywood? Does anyone have an estimate of how much it costs to build this ?